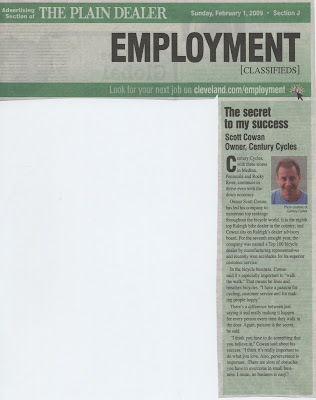 The Plain Dealer's Terri Mrosko profiled Century Cycles owner Scott Cowan last Sunday in her special weekly feature, "The secret to my success." Click here for the online version of the article, or you can read it below. Century Cycles, with three stores in Medina, Peninsula and Rocky River, continues to thrive even with the down economy. Owner Scott Cowan has led his company to numerous top rankings throughout the bicycle world. It is the eighth top Raleigh bike dealer in the country, and Cowan sits on Raleigh's dealer advisory board. For the seventh straight year, the company was named a Top 100 bicycle dealer by manufacturing representatives and recently won accolades for its superior customer service. In the bicycle business, Cowan said it's especially important to "walk the walk." That means he lives and breathes bicycles. "I have a passion for cycling, customer service and for making people happy." There's a difference between just saying it and really making it happen for every person every time they walk in the door. Again, passion is the secret, he said. "I think you have to do something that you believe in," Cowan said about his success. "I think it's really important to do what you love. Also, perseverance is important. There are alots of obstacles you have to overcome in small business. I mean, no business is easy."